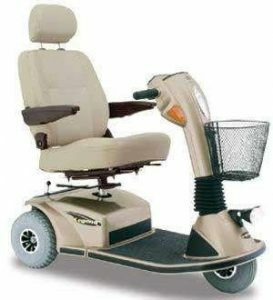 The Pride Legend Mobility Scooter is the top of the line medical mobility scooter from Pride Mobility. The Pride Legend Scooter features a reclining high-back seat with adjustable headrest and an optional power elevating seat that will ensure you always have the most comfortable ride possible. Safety is no afterthought with the luxurious Legend Mobility Scooter either. A dual-bulb adjustable headlight illuminates your path at night and there is a tiller mounted headlight that keeps you visible. Not only can it reach speeds of up to 5.75 mph while safely carrying up to 350 pounds, but it also includes a unique lockup system that makes disassembly and reassembly a simple task. The Pride Legend Scooter comes in three colors; candy apple red, viper blue, champagne and like most Pride Scooter models is available in both three and four-wheel versions. The Legend Mobility Scooter offers a smooth and quiet ride for indoors; power, range and stability for outdoors. It is truly the perfect fit for a day at the park or an evening formal affair. This model is available at US Medical Supplies. They are one of the world’s largest suppliers of medical and mobility products with over 10,000 products offered at discount prices. They place a special emphasis on products such as medical mobility products because they understand that personal independence is critical to your quality of life. Free shipping is provided as well as a one-year in-home part and service warranty. 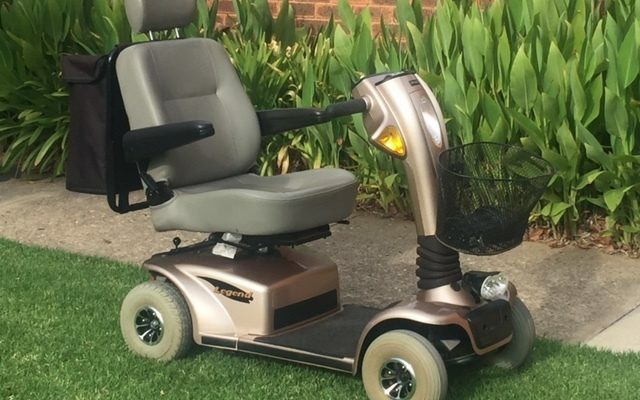 To purchase this model, simply select here: Buy the Pride Legend Mobility Scooter. Its good as your other articles : D, thankyou for posting.